BGA is short for Blue Green Algae, also known as Slime or Smear Algae. It can be seen in the typical blue-green colour but will also occur in brown. This 'algae' is actually Cyanobacteria (this bacteria obtains its energy through photosynthesis). It forms a blue-green slime that will cover everything in a very short time. If left to overrun the tank, cyanobacteria will kill plants and fish (some species of cyanobacteria produce toxins in the water so care should be taken in removing it). UltraLife Reef Products "Blue-Green Algae Remover" (SKU 9086910020) seems to work well - the small 0.71 oz. (20 g) vial treats 473 Litres (125 US G.), so I did two treatments of my 284 Litres (75 US G.) heavily planted, moderately populated tank two days apart as allowed (one must wait another week before using it again). 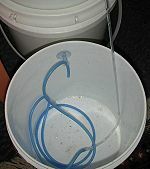 I had been routinely physically removing as much as I could from various plants, driftwood, filter tubes, etc., with a piece of rigid airline tubing and a bunch of flexible airline tubing as a siphon as the first step of my weekly water changes, and observed how it grew back in various places over a few days. On the date of the first treatment I did this first. For a time it seemed like nothing changed - the "bga" certainly wasn't "dying off" - but then I noticed that it also didn't seem to be growing back. I did the second treatment two days later after a water change. Two days after that, there was no regrowth whatsoever - normally by then there would be a fresh sheet all over the driftwood, and fresh globs in various other places. Anywhere I dislodged the remaining colonies, they just don't re-establish. On the "uncleaned" end of the tank, there was now nice healthy brown algae growing where once was a film of bga. This stuff seems to work. The tank no longer has that "bga smell", also. Update, by six days after treatment I noticed that some "unremoved" bga on an unscrubbed tank end was gone. Nine days after the first dose it is all gone, the last bits seemingly disappearing overnight. It is ironic that a freshwater-only product is being sold by a company with "reef" in their name. Water quality testing is recommended during treatment, since depending on how much is left when treatment begins, a fair amount of decaying bacteria will be stressing your filtration. I saw no effects on my fish or plants, but one should be prepared for "emergency" dilution via a 20% water change just in case, likewise be prepared for filter media cleaning. The pH remained stable at 7.4 in my case. I think removing as much as possible prior to treatment should be recommended, since it is not that difficult. The active ingredient(s) are unknown and unpublished, so I cannot ascertain legality is some jurisdictions, but I was readily able to buy this online from theaquariumguys.com for about ten US dollars (just a couple of euros) plus shipping. If I find what the product uses I will report here. This page was last edited on 14 October 2011, at 09:27.